The most important piece of dirt bike safety equipment is sitting squarely on your shoulders and you need to protect it at all costs. Gloves, goggles, and boots are also important, but a helmet is the first safety item a beginner dirt bike rider needs to buy. Fortunately, there is a huge selection of dirt bike helmets on the market and you don't need to spend hundreds of dollars to get a decent dirt bike helmet. You should be able to get a good quality helmet with both DOT and Snell certifications for about $150. There are cheaper helmets on the market, but go for a brand name. Remember the saying - if you have a $10 head, buy a $10 helmet. Beginners don't crash as hard as experienced riders, but usually crash more often, so don't skimp on the helmet. What is a DOT helmet rating? The U.S. DOT (Department of Transportation) has set minimum safety standards for motorcycle helmet construction, and the sticker on the back of the helmet is supposed to be an indicator that the helmet has met those standards. The problem with DOT certification is that it's based on the honor system, so it's basically up to the helmet manufacturers to comply with the safety requirements before they affix the sticker (this is another reason to buy a brand name helmet). You can check this DOT page to find out the minimum standards for a motorcycle helmet. 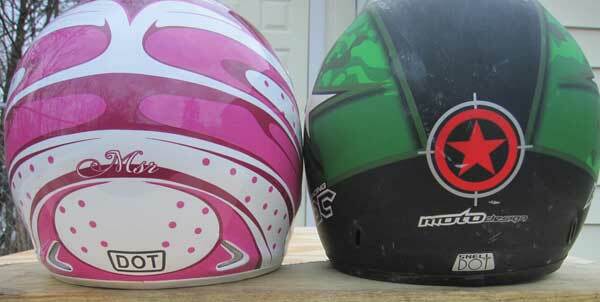 The image below shows the DOT and Snell stickers that should be on the back of a dirt bike helmet The helmet on the left only has a DOT rating, but the helmet on the right has both the DOT and Snell rating. What is a Snell helmet rating ? The non-profit Snell Foundation takes helmet testing to the next level with more rigorous testing than the basic DOT tests. The helmet manufacturers have to apply for the sticker with the Snell Foundation before putting it on the helmet as opposed to the honor system used with DOT. The Snell tests include Impact, Roll-Off, Dynamic Retention, Chin Bar, Shell Penetration, Faceshield Penetration, and Flame Resistance. You can read more about the various tests on the Snell website. If you're buying the helmet used (not a great idea) make sure it still has the DOT and/or Snell label on the back of the helmet. Those labels don't just 'fall off' so if it's not there, chances are it never was. It's always best to shop locally especially for something that's bulky like a helmet, but if there are no local shops you'll have plenty of choices online. Google 'dirt bike helmet' and you should get plenty of online stores. Helmet sizing charts are fairly consistent, but the helmet still might not fit perfectly and return shipping costs can get expensive. Be sure to check the return and shipping policy before buying - find out who pays return shipping as well as who pays shipping on the replacement helmet. Also check that the helmet is adult size, not youth size, and that's it's a dirt bike or motocross helmet, not a dual-sport helmet. The manufacturers have a knack for making their helmets sound like like they're made of materials that would make NASA engineers drool but generally, the entry-level helmets have less padding, are a bit heavier, and have fewer ventilation holes than the more expensive helmets. Some entry level dirt bike helmets on Amazon are the Fox Racing V1 helmet, and the One Industries Atom Fragment helmet. Higher-end dirt bike helmets include Troy Lee Designs SE3 Reflection helmet, and the Shoei VFX-W Sear helmet. Unless you absolutely need the latest and greatest dirt bike helmet, look for last year's model because they're usually considerably cheaper.